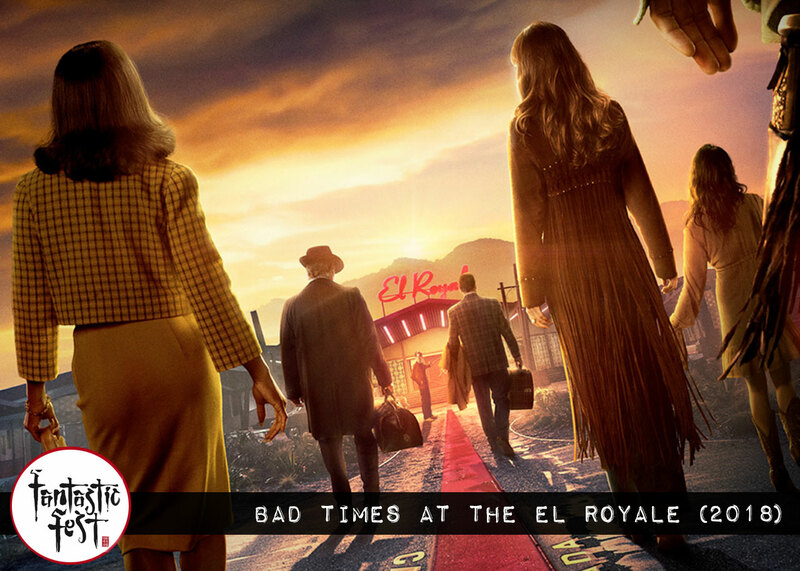 “Bad Times at the El Royale” combines a stellar cast, stunning design, and a shrewd script to deliver one of the year’s best times at the theater. In a week replete with stunningly original and thought-provoking hidden gems from around the world, Austin’s Fantastic Fest ended as it began — with a highly anticipated mainstream genre film with mass appeal. 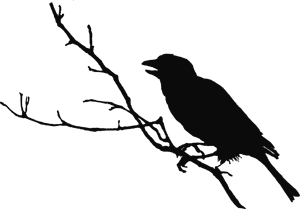 Not that I’m complaining. The fest gave me the opportunity to experience some of the most artistically beautiful, intellectually challenging, and deeply affecting films I’ve ever seen. But it was an inspired programming choice to end 8 days of avant-garde cinema with a rousing crowd-pleaser like Bad Times at the El Royale. As much as I loved those brilliant films that made me question the nature of humanity and the existential meaning of life, Bad Times reminded all of us ‘sophisticated’ cinephiles why we fell in love with film in the first place. There’s nothing like a film whose only goal is to entertain the hell out of you for a couple of hours, and Bad Times at the El Royale is pure cinematic joy. Which isn’t to say it’s not a smart film. Writer/director Drew Goddard follows up his 2012 debut The Cabin in the Woods, an ingenious deconstruction of the horror/slasher, with a stylish and exceedingly clever thriller and ode to Tarantino-esque 90s crime dramas. It’s the late 1960, and seven strangers arrive at a hotel in Lake Tahoe with both literal and metaphorical baggage. Straddling the border between California and Nevada, the once glamorous and swinging hotel that welcomed celebrities and socialites, is now all but deserted. 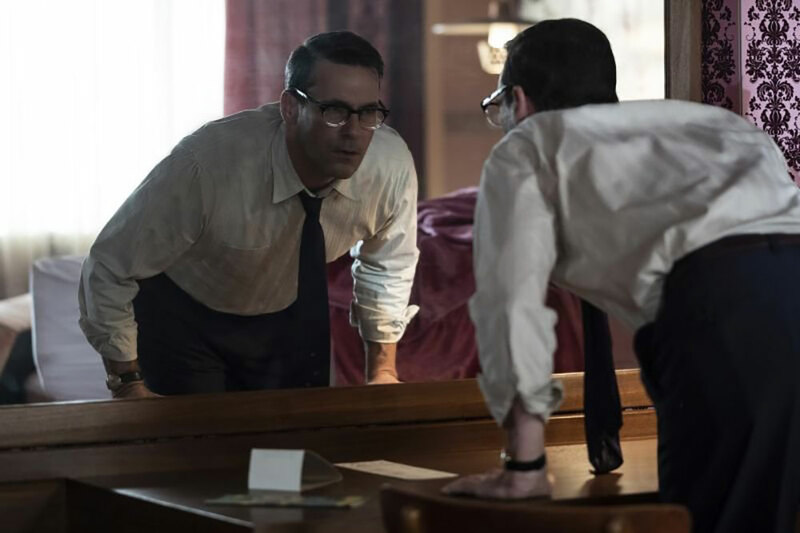 One nervous young worker named Miles (Lewis Pullman) remains to check guests in, tend the bar, clean the rooms, and keep the hotel (barely) afloat. There’s a literal line that runs down the hotel, separating each wing of the hotel between the California side and the Nevada side. But guests at the El Royale can easily cross the line between states to indulge in the amenities of the other side. It’s a clever metaphor for a film that explores the often blurred line between right and wrong, good vs bad. While it’s undeniably witty and stylish, Goddard crafts a smart and at times unnerving thriller that has enough darkness lurking beneath the glitzy surface to appeal to his large and loyal genre fanbase. Through a masterful use of misdirection, non-linear storytelling, and refreshingly surprising plot twists, he keeps you guessing and glued to the edge of your seat. Like the titular hotel itself, everyone here has a secret to hide. And those secrets are revealed in the most ingenious and tantalizing ways. Revealing much more would ruin the experience though, as this is a film best enjoyed knowing as little possible. Exceptional sound design and an infectious Motown soundtrack strikes the perfect balance of light and dark notes in a film that is as eerie as it is offbeat. As the marketing suggests, this is primarily an ensemble film that gives its enormously talented cast free reign to flex their considerable acting talents. In a film so dependent on the strength of the performances, everyone here brings their A game. 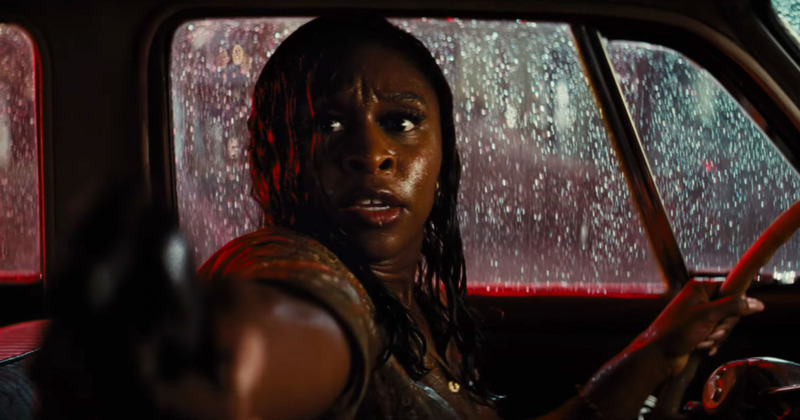 Cynthia Erivo (Chewing Gum) is mesmerizing as Darlene Sweet, a struggling singer who serves as the heart and soul of the ragtag group of travelers. She delivers an emotionally charged performance with little dialogue. But her powerful monologue during the film’s climax is likely to make women everywhere stand up and cheer. This was the second film I saw during the fest featuring Dakota Johnson (the first being her remarkable turn in Suspiria), and she’s definitely on the road to becoming a full-fledged megastar — effortlessly eroding her association with the seedy Shades of Grey series. Her performance here as smart-mouthed hippie Emily proves she’s capable of bringing considerable depth to more multi-dimensional roles. 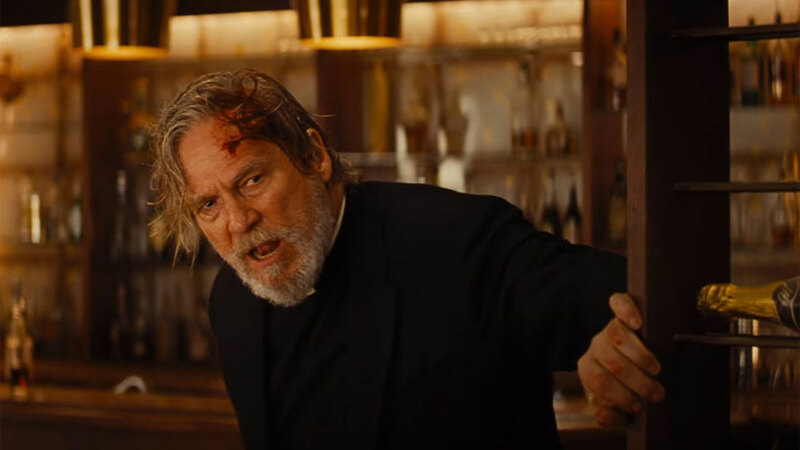 To say Jeff Bridges is remarkable as the troubled priest known as Father Flynn almost assuredly goes without saying, but he’s as good here as he’s ever been in a subtle and richly layered role about a man coming to terms with past mistakes and the painful reality of the aging process. Mad Men’s Jon Hamm is also perfectly cast as suave yet smarmy Southern vacuum-cleaner salesman Laramie Seymour Sullivan. A shredded, bare-chested Chris Hemsworth plays a ridiculously pretty and charismatic cult leader named Billy Lee. While his Manson-inspired role is not as meaty as the film’s marketing would have you believe, he does play a pivotal part in the film’s hugely entertaining climax — exuding massive amounts of both creepiness and charm. 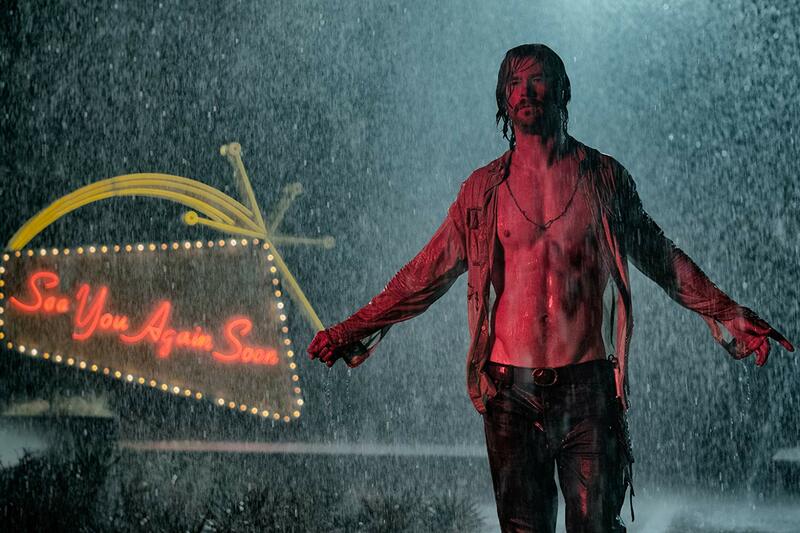 Goddard is one of the most exciting and innovative filmmakers working today, and ‘Bad Times at the El Royale’ is a stunning showcase for his wholly original vision and unique narrative style. He has an uncanny ability to seamlessly blend humor and hyper-violence to create a complex film that’s as intelligent as it is endlessly fun. Go see this film!